The sport of Dock Diving is one of the fastest growing dog sports on the continent at the moment. Why? Because it’s so much darn fun for the dog AND the handler! As breeders of a fanatical, water-loving breed, we’ve been dabbling in dock diving on our own for some time. 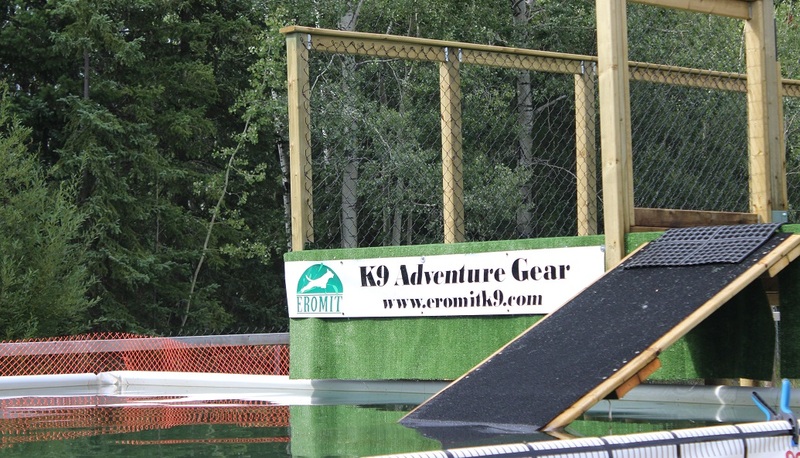 We attended our first competition in 2013 and in 2015 took it up more seriously, building a regulation dock and pool here at Eromit Acres so that our dogs can practice throughout the summer and so that we can share this sport with others. 2019 Status: Weather dependant- aiming for mid May! Basic Dock Diving Lessons: 6 week group lesson set to get your dog learning the sport of dock diving! We cover safety issues and warm up, ground-work exercises that you can practice at home, and provide an introduction of your dog to the pool and dock, covering the basic skills you need to get started in competition. All handlers completing this seminar are able to come out to open dock practices to continue their skills- some dogs who complete this session may be ready to start competing! Prerequisites: Dogs must be healthy and sound, a confident swimmer AND be excited about fetching a favorite toy. If your dog is a reluctant or new swimmer, please see our ‘Learn to Swim’ Lessons. Prerequisites: “Graduation” from basic lessons or previous experience training/competing in dock jumping. Private Lessons: – if you’d like some one on one help with a dock diving problem, need assistance teaching your dog to swim and be comfortable in the water, or would just like some extra time in the pool, please contact us to set up a private lesson or pool practice. Rates- $40 for a half hour lesson for one dog. Discounted rates for additional dogs or time are available. Open Dock : Wednesday evenings are ‘open dock’ practice nights, come out and get some jumping and swimming practice for your furry friend. Open Dock practice is open to all dogs/handlers who have been properly introduced to the pool and dock either through our Give It a Try session, private or group lessons, or prior dock-pool experience. (IF YOU ARE NOT SURE IF YOUR DOG IS READY, PLEASE ASK PRIOR TO ATTENDING). No instruction is provided but supervision/assistance is present. Each team that shows up for open dock practice will rotate through the running order, accruing as many turns on the pool as time and interest allows. Each turn is limited to 2 minutes. Cost is $15 for the first dog and $10 for each additional dog from the same family on the same night- or save some money by purchasing a 10- practice punch card for $120 (one punch/practice per dog). Pool Rentals- If your dog has been introduced to the pool, you may rent it in one hour blocks for dock diving practice or swimming fun. Rates are $60 per hour includes up to 3 dogs. Each additional dog during that hour is $10. Who can enter? — Any healthy, sound dog over 6 months of age who loves to swim and fetch! Dogs may be handled by a human 7 years of age or older. A handler may also use an optional “dog holder” on the dock during NADD events for a maximum of 2 people on the dock at a time. I’ve never done this before. How do I know what to enter? 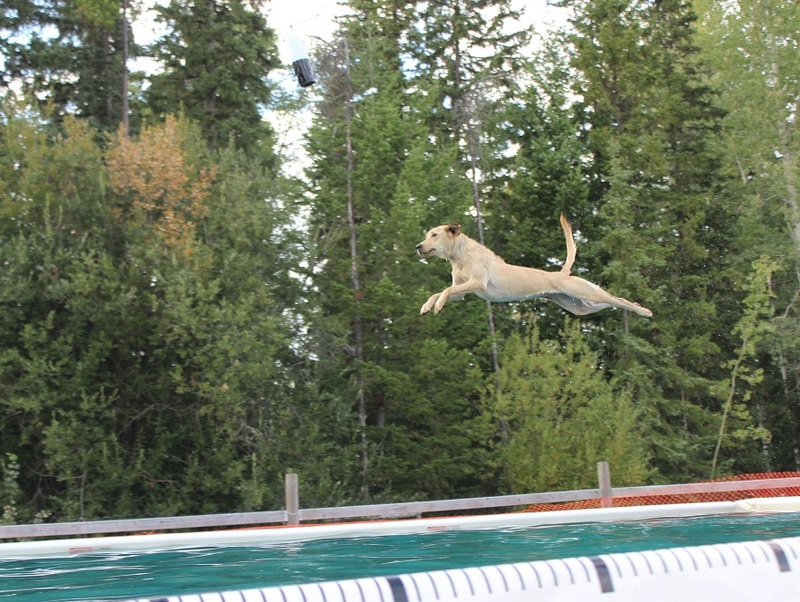 — There are 2 types of competitions at North America Diving Dog events. These are the distance event, where the length of your dog’s jump is measured. Then there is the Air Retrieve event, where your dog will be attempting to grab a nerf bumper that is suspended above the pool- the distance will be increased by one foot after each successful jump and the longest distance grab that your dog makes is their qualifying score. If your dog misses twice at once distance, or 3 times overall, they are out and their score will be their longest successful grab. Dogs are divided into pre-determined divisions for placements. For most dogs, the best place to start is the distance event- your dog just needs to jump into the pool to earn a score, and can chase their preferred toy. There will be training lessons and practice opportunities for those who’d like to try Air Retrieve before the event so you may want to try those before entering. What Division should I enter? — You do not choose a division. Your dog’s best score will determine which other dogs they are competing against. This means that your dog is only competing against dogs of similar abilities, and makes it fair and fun for dogs of all levels! Additionally, “Lap dogs” (dogs 16″ or less at the withers) compete only against other small dogs in their own divisions which are proportionate to their size. For example, in the distance event, there are 5 divisions. You will choose how many splashes to enter (a splash consists of 2 jumps, only the best jump is scored). For titling purposes, your dog requires 5 jumps in the same division to earn a basic title (5 splashes with similar scores). See the NADD website for complete rules or contact us for clarification! My dog jumps off the dock at the lake but has never been in a pool. Can I enter? — Yes! But, a pool is quite different for most dogs, because the water is clear, they can see the bottom, and they don’t necessarily understand that it’s the same thing as at the lake! So, though it’s not required, we recommend signing up for one of the training sessions before the competition to get your dog used to the dock and pool ahead of time. If that’s not possible, plan to arrive early on competition day – dogs who are entered in at least one splash of competition are permitted to use the pool between events for practicing. You can also purchase ‘try it’ tickets which allow you to use the pool between competitions, without having to enter. What do I need to bring to the event? — Your (healthy, well-groomed/nails-trimmed dog), a flat collar (no e-collars, head halters, choke chains or pinch collars allowed on the dock), a 4 foot leash. A crate and shade for your dog, water bowl, water and treats, and of course, his favorite retrieving toy! Almost any kind of toy is permitted as long as it floats, does not contain food, and is not a live or dead animal (no toys with real fur or feathers). For yourself, come prepared for all weather (sunscreen, bugspray, change of clothes, etc) and a lawn chair. Bring enough towels to keep you and your dog dry between events! We also have a concession at most events so bring some cash for food and entries! I just want to try it. Do I have to enter all of the events? —- No! Just enter in the events you are interested in, on the day of your choosing.